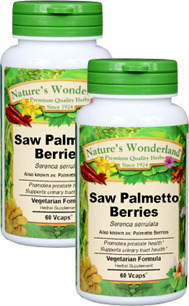 Saw Palmetto Capsules - 700 mg, 60 Vcaps™ each (Serenoa serrulata) - Penn Herb Co. Ltd. Saw Palmetto is the leading herb of choice for promoting prostate comfort, healthy urinary function, and sexual health - especially for men over 50. Saw Palmetto has been linked with urinary and reproductive health ever since early Native American tribes used the berries as a diuretic and sexual tonic. It was even included in the United States Pharmacopoeia in the early 1900s. Today, Saw Palmetto's natural fatty acids are recognized for providing nutritional support for prostate and male sexual function. Hormonal balance; mild herbal diuretic; bladder health; digestive aid; thyroid function. As an addition to the diet, take 1 or 2 capsules three times daily with water at mealtime. NOT TO BE USED DURING PREGNANCY OR WHILE NURSING.